Funding for this project comes from an award from the NYC Digital Humanities Community. Funding for the initial archival research comes from 2014 and 2015 Advanced Research Collaborative Knickerbocker Awards for Archival Research in American Studies. Funding for additional archival research comes from a 2016 Travel-to-Collections Grant from the Sophia Smith Collection at Smith College. This digital network and geographic mapping project visualizes cartoonist Alison Bechdel’s participation in grassroots periodicals she worked on and/or published her long-running Dykes to Watch Out For (DTWOF) comics series in. While Bechdel is one of the most written-about and taught cartoonists due to her recent graphic narratives, little work has been done on DTWOF and Bechdel’s accompanying earlier comics. Because Bechdel published in 150+ periodicals over the course of DTWOF‘s run (1983-2008), this project illustrates the evolution within periodical culture in an understudied period when changing political ideas led to the rise and fall of grassroots publications. Only now are publications like these becoming accessible through digital collections. 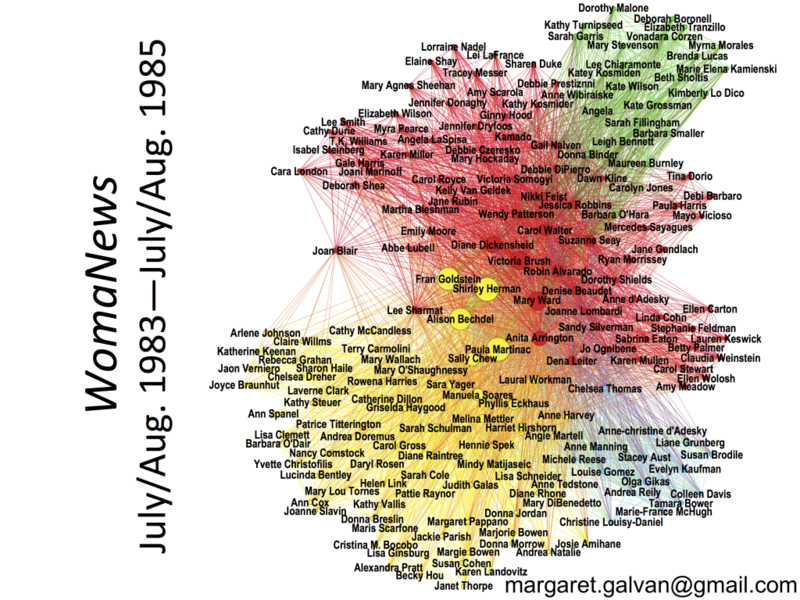 I use Gephi to visualize Bechdel’s connections to other people working on the same periodical as her when she worked at WomaNews (1983-1985) and Equal Time (1986-1990). Additionally, I employ CARTO to map Bechdel’s own publication data to show where and when she published to study the national and international spread of her work. This network visualization depicts the women Bechdel worked with in her two years at WomaNews. January 2014: I give a talk, “Collaboration as Consciousness Raising: The Bodies of Feminism in Wimmen’s Comix,” on the Collaboration in Comics Panel at the Modern Language Association conference. This presentation features a Gephi visualization I built of the network of women who worked on the comics series over two decades. Spring 2014: I research Bechdel’s participation in WomaNews by consulting a full-run of the periodical at the Lesbian Herstory Archives in Brooklyn, NY. June 2014: With funding from the 2014 Advanced Research Collaborative (ARC) Knickerbocker Award for Archival Research in American Studies, I study Bechdel’s partially-processed papers held in the Sophia Smith Collection at Smith College. July 2014: With funding from the 2014 ARC Knickerbocker Award for Archival Research in American Studies, I study the records of Bechdel’s longtime book publisher, Firebrand Books, held in the Human Sexuality Collection at Cornell University. September 2014: I give a talk on my archival research on Bechdel in a panel I co-organize, “Feminism and Archives” at The Graduate Center, CUNY. May 2015: I give a talk, “Visualizing Grassroots Feminist Networks of the 1970s and 1980s,” at the Women’s History in the Digital World Conference at Bryn Mawr College. This presentation features my Wimmen’s Comix visualization along with a visualization of the WomaNews network for the two years that Bechdel participated in the collective. July 2015: With funding from the 2015 ARC Knickerbocker Award for Archival Research in American Studies, I study Bechdel’s participation in Equal Time by consulting a full-run of the periodical at the ONE National Gay & Lesbian Archives at the University of Southern California. August 2015: I apply for and am granted an award from the NYC Digital Humanities community to develop Mapping and Networking Alison Bechdel. November 2015: My article, “Archiving Grassroots Comics: The Radicality of Networks & Lesbian Community,” which features a discussion of Bechdel and her archives in relationship to other visual collections and genealogies of lesbian cartoonists, is published in the “Radical Archives” issue of Archive Journal. Fall 2015: I organize Bechdel’s publication information from the four archival collections in Excel. Spring 2016: I import Bechdel’s publication information into Gephi and CARTO and start to produce additional visualizations and maps. February 2016: I present on the development of this project for the NYC Digital Humanities community during NYCDH Week. May 2016: I present on this project at the Queer Circuits in Archival Times Conference at The Graduate Center, CUNY. May 2016: I present on this project at the Gay American History @ 40 Conference at The New School as part of the “Lesbian Resistance and Love in Twentieth Century American History: Restoring More Stories” panel. July 2016: With funding from the Travel-to-Collections grant awarded by Smith College, I revisit Bechdel’s partially-processed papers held in the Sophia Smith Collection, accessing further information about her publication history, including in newly accessioned material. I also consult the periodicals collection to directly locate Bechdel’s work in various local contexts. July 2016: I include findings and visualizations from this project in an article that I submit that is under review for a “Queer about Comics” special issue of American Literature. Fall 2016: I receive a book contract with the University of Minnesota Press that will allow me to develop a monograph, In Visible Archives of the 1980s, alongside a digital project on their new Manifold Scholarship digital platform. One of the uses of this digital space will be to produce these network visualization as interactive, able to be annotated and developed to generate further research. Fall 2016: I participate in the Five Colleges-supported Beyond the Riot grant, sharing my research on visualizing grassroots networks. June 2017: I will present on this work at the Berkshire Conference on the History of Women, Genders and Sexualities as part of a panel I organized: “As Difficult as We Please: Doing Digital Histories of Gender and Sexuality.” I will be discussing Bechdel’s grassroots networks alongside the more recent digital networks that she facilitates through her website. 2017: In a forthcoming article, “Archiving Wimmen: Collectives, Networks, & Comix,” in a feminism and archives issue of Australian Feminist Studies, I discuss different methods of how we can visualize the networks of women who produced Wimmen’s Comix, including producing network visualizations, examining existing archival finding guides, and analyzing the women’s own visual renderings of their collective experience. This project of visualizing and mapping Alison Bechdel’s early publication history comes at a time when she is a culturally resonant and widely celebrated figure, having been awarded Guggenheim (2012) and MacArthur (2014) Fellowships in addition to the five Tony Awards won this year by the musical based on her celebrated graphic memoir, Fun Home. This renown has been building since the 2006 publication of Fun Home that rocketed her from a cartoonist beloved by lesbians to a more broadly known figure. In the years since, Fun Home has become one of the most taught and written-about graphic narratives, assured of its place in the canon by works of criticism like Douglas Wolk’s Reading Comics (2008), Elisabeth El Refaie’s Autobiographical Comics (2012), and Hillary Chute’s Graphic Women (2010) and Outside the Box (2014). And, yet, Bechdel’s early work, namely Dykes to Watch Out For, her comic strip that ran for two decades from the 1980s-2000s, receives disproportionately little attention. While smart analyses of Fun Home by noted critics like Chute, Ann Cvetkovich, Valerie Rohy, and Julia Watson unpack how Bechdel develops a queer worldview by linking her personal story to larger cultural narratives, they do not unpack how much of this subcultural knowledge arises out of Bechdel’s work on DTWOF, which exposed her to decades of queer politics through both the publications she worked on and also those she published in. DTWOF, a comic strip featuring an ensemble cast of queer, mostly lesbian characters, ran for 527 strips from 1987 through 2008, self-syndicated in as many as 50 grassroots publications at any one time. In its earliest incarnation, however, DTWOF began in 1983 as one-panel comics published in WomaNews, a New York City-based feminist monthly newspaper. From 1983 through 1985, as Bechdel worked directly on the production of the newspaper as a member of the collective, she developed DTWOF from one-panel takes to one-off strips meditating on different topics within lesbian subculture. It was thisformative period and her years (1986-1990) as Production Coordinator at Equal Time, a Minneapolis-based LGBT monthly newspaper, that I want to analyze deeply by visualizing with Gephi the networks of people actively working on these publications during the same period that Bechdel did. We know from interviews of the impact on Bechdel that lesbian theorist and activist Sarah Schulman had, which dates from the time they both worked at WomaNews. By creating Gephi networks of these publications, I hope to highlight further nodes of personal influence that touched Bechdel’s comics work and politics as she developed her strip. At the 2015 Women’s History in the Digital World Conference in May 2015, I presented a paper, “Visualizing Grassroots Feminist Networks of the 1970s and 1980s,” that analyzed Gephi networks I created of the underground comix series, Wimmen’s Comix, alongside a first iteration of a network of WomaNews. In this paper and in an article in an issue of Archive Journal, I discuss how such network visualizations can highlight little-known names who may have had a large impact and suggest entries into future research not only on Bechdel but into this understudied arena of grassroots periodicals. While these networks are a starting point to understanding Bechdel’s direct connections to activist subcultures, a second phase of this project seeks to geographically map all of the 150+ periodicals that DTWOF appeared in over its two-decade run. For this portion of the project, I will employ CARTO, for it allows the ability to layer in the element of time onto the map. I will be able to illustrate not only where all of these publications were located, but more importantly animate Bechdel’s changing geographic reach over time. As part of this map, I will also include Bechdel’s own geographic locations—from New York City to Northampton to Minneapolis to rural Vermont—during these years. These movements coincide with her direct involvement in the aforementioned grassroots periodicals, and I am interested to see more of how they intersect with her publication history. In a talk on a “Feminism and Archives” panel I co-organized in September 2014, I analyzed correspondence from Bechdel’s papers, which demonstrate how much of a personal connection she had with the various periodicals in which she published and how much these letters and associated materials, in addition to the newsletters themselves, influenced the content of her comics and kept her connected to queer and activist subcultures worldwide. As much as it has arisen out of my archival research on Bechdel, I intend for this project to generate future research. My archival research has made me aware of the important role of these periodicals, particularly as spaces where she would publish political illustrations not reprinted or mentioned in any consideration of her work, even her own retrospective volume, The Indelible Alison Bechdel (1998). I consider this research as a project that will shine light on these materials.